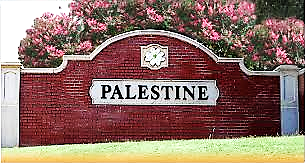 C & C Heating and Air is proud to serve the Palestine community! About Palestine, TX - Happy to be your hometown Heating & Air Conditioning Contractor! Palestine is located in northeastern Texas, approximately 100 miles southeast of Dallas and 150 miles north of Houston. Established in 1846, the city is home to a population of more than 18,000 residents and is the county seat of Anderson County. Palestine is served by the Palestine and Westwood independent school districts and is home to Trinity Valley Community College and the Palestine campus of the University of Texas at Tyler. The city’s strong progressive economy makes it a great place to work and do business. Home to more than 2,400 businesses based primarily in government, transportation, and shipping, the city continues to draw new residents and businesses each year with low unemployment, short commute times, and a cost of living index more than 20% lower than that of the national average. Palestine’s humid subtropical climate produces moderately hot summers and mild cool winters – perfect weather for enjoying the numerous opportunities for outdoor sports and recreation that dominate the region. The city is home to Davey Dogwood Park, a 200-acre natural park that is featured during the annual Texas Dogwood Trails Festival held during late March and early April. Popular area fishing lakes include Wolf Creek Lake, Blue Lake, and Upper and Lower City Lakes, as well as Lake Palestine, a 25,000-acre recreational reservoir located 45 miles northeast of the city that offers excellent fishing for crappie, catfish, redear sunfish, and largemouth and spotted bass. Palestine is a designated Texas Main Street City. The city’s historic Main Street District covers 44 blocks of Downtown, Old Town, and the Courthouse Square with an eclectic collection of retail shops, fashion boutiques, art galleries, antique stores, and dozens of historic buildings that include The Redlands Hotel, Anderson County Courthouse, and Palestine Carnegie Library, one of only 13 remaining Carnegie Libraries in the state of Texas. The district is home to the Palestine Main Street Art Tracks, a juried outdoor sculpture exhibit that features rotating sculpture art by artists from around the state in prominent locations throughout downtown. Visitors to Palestine won’t want to miss a ride aboard one of the historic steam and diesel powered trains operated by the Texas State Railroad. The railroad features roundtrip excursions through Texas State Railroad Historical Park, a stretch of land no wider than 50 to 200 feet in most places that meanders through the East Texas countryside for 25 miles from Palestine to the city of Rusk. Situated at the crossroads of U.S. Route 79 and U.S. Route 287, Palestine’s commitment to family, community, and quality of life makes it a great place to live in East Texas!